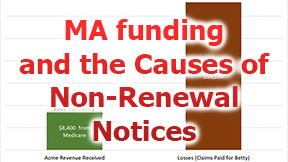 For those of you that have received a non-renewal notice from your Medicare advantage company, we encourage you to review our companion article, I Received a Disenrollment Letter: What Now? It will explain your choices. Note: In the discussion that follows, I have simplified some concepts for brevity. The concept of Medicare Advantage (MA) plans began with the 1982 Tax Equity and Fiscal Responsibility Act (TEFRA). This act allowed privatized Health Maintenance Organization (HMO) plans to contract with Medicare to deliver a form of privatized Medicare. Health insurance companies later exited this privatized Medicare marketplace because the funding from Medicare wasn’t keeping up with rising costs. The Balanced Budget Act of 1997 established the Medicare+Choice program. This was renamed Medicare Advantage by one of the provisions of the 2003 Medicare Modernization Act (MMA). It was this act that also stepped up the controversial capitation rate for the MA plans. MA plans are privatized in that Medicare sends a certain amount of money per person per month to the sponsor, usually a large health insurance company, of the MA plan. This is called the capitation rate. This means that, for example, the base rate that the MA plan sponsor receives from Medicare is about $700 per month for every member enrolled in the sponsor’s plan. Simply put, they get so much per head per month. That’s the capitation rate. Medicare Funding for the MA health plan: $700 per month (Note: this can be much higher for people with more health issues. 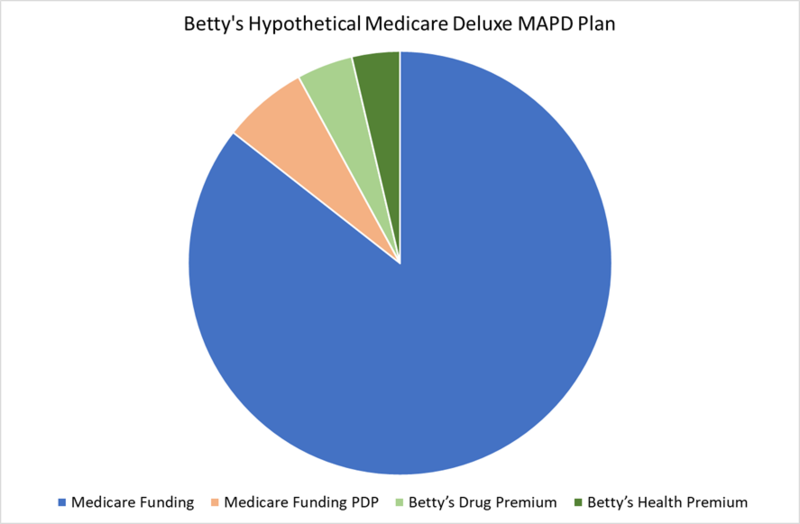 ), Medicare Funding for a prescription plan: $53 per month, Betty’s Premium: $65 per month. The breakdown is as follows: $30 is her contribution to the health plan, and $35 is for her prescription part of the plan. Let’s say that Betty has a knee replacement surgery with a total bill of $30,000. Her hospital stay is for three days. Her plan has a hospital copay of $300 per day with a five-day cap. Acme pays for all days that exceed five. Betty pays $300 per day x 3 days or $900 to the hospital. The hospital bills the balance of $29,100 to Acme, not Medicare. Remember, as far as claims go, Medicare is out of the picture. Let’s say the Betty had physical therapy after her surgery, some labs, doctor visits and other miscellaneous medical events that cost Acme an additional $4,000 during the course of the year. 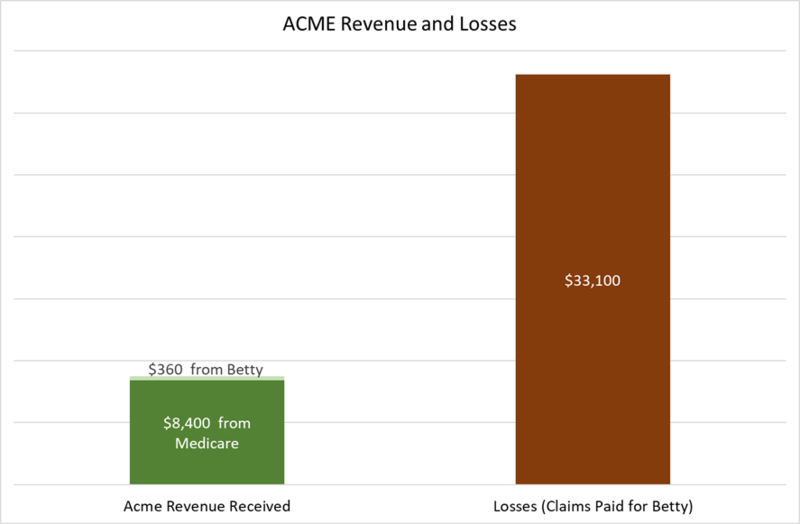 In this example, we can see that Acme losses were almost four times more on Betty’s behalf compared to the revenue they received from Medicare and Betty. Just to break even, Acme Insurance needs three other members’ (Alice #1, Alice #2 and Alice #3) revenue and little or no claims from those members. As long as Acme only has a few Bettys and lots of Alices, they will be okay. They can maintain their $65 per month premium for 2018, keep their copays about the same, and maintain their extras such as a vision, dental, or health club benefit. In this example, we have the fictitious state of West Mountain. West Mountain has forty counties, and Acme has their MA plans in twenty of them. Acme’s bean counters have observed that they are consistently losing money in Wolf, Grizzly, Coyote, Rattlesnake, and Scorpion counties. These are low population, rural counties. To aggravate this problem, Medicare’s capitation rate in these counties is lower compared to the more urban ones. Worse yet, Acme is having difficulty finding enough specialists to serve on an “in network” basis in those counties. To stem these losses and maintain the integrity of their Medicare Deluxe plan, Acme has decided to cut loose those five losing counties. They file their plan with Medicare, and they send non-renewal letters to their members in those five counties in early October. Simply put, they had too many Bettys and not enough Alices. This is exactly what the now defunct New West Medicare did in Montana a few years ago. They had substantial losses in ten counties, so they non-renewed their members in those counties. Medicare advantage plan sponsors cannot drop an individual high claims member, but they can drop a high claims county. In one rural county that New West dropped, I had one client that had a hip replacement surgery and another that was in the hospital in Billings for two and a half months. There couldn’t have been enough Alices to make up for those two Bettys. Also, there could have been more Bettys that I didn’t know about. Exiting some counties can be a stop gap measure that buys time for a year or two. What happens if the losses begin to mount statewide? That’s what happened to New West in 2016. The decision makers looked at the numbers, and they weren’t good. In October of 2016, all New West MA members received their non-renewal notices. * While there were other factors in New West’s demise, the bottom line is that they lost enough money that they pulled their plans and exited the market. *Important. Be sure to keep your non-renewal notice. You may need it! Let’s say that Acme has lost money in most of West Mountain, but they want to stay in the game. Here’s their strategy. Drop their high loss counties. They also could trim some of their extras such as their vision or dental benefit. Your higher premiums and higher copays will generate more revenue for Acme. If it all works, they will continue to offer their plans. Things to Remember About Medicare Advantage plans. Medicare advantage plans are privatized. The providers bill the plan sponsor (generally insurance companies) and not Medicare. The insurance company can’t operate at a loss, or it will go out of business. The company can decide which counties it desires to sponsor MA plans in any given state. Low population counties may not have any MA plans. Receiving non-renewal notices for most people is an unsettling hassle. It involves change, and many people, including me, don’t like it. Now your Medicare plan needs to be redone. I believe that having a basic understanding of how Medicare advantage funding works, can be a useful tool in your decision-making process. Please click here to consult our companion article, I Received a Disenrollment Letter: What Now?